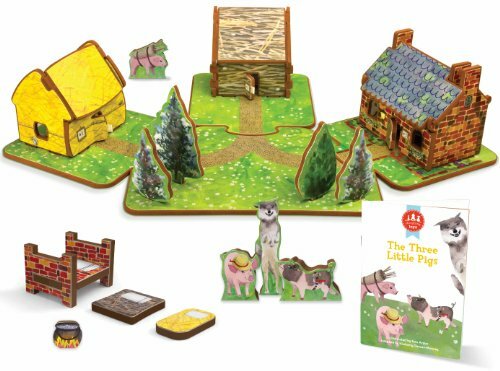 Bring the classic story of the Three Little Pigs to life with this darling play set. Start by reading the included storybook and then build the three little pigs’ houses and furniture. Use the pig and wolf dolls to act out your own version of the fairytale. The Three Little Pigs houses come together to make a fun and exciting neighborhood to play in! The straw and stick houses are designed to “blow down” easily while the brick house stands strong. The wolf actually fits down the brick house chimney, only to land in a pot of boiling soup. The toy house and furniture assemble by pressing tabs into tab holes. No tools or screws required. And, all of the pieces store flat in a small carrying case. Made from EVA foam and cardstock.